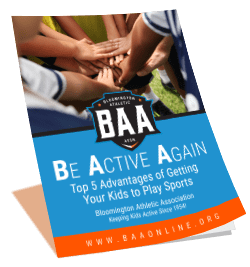 WHAT: A typical baseketball season consists of Player and Coach Clinics, pre-season practices, an exhibition game, 8-12 regular season games, with 2 or 3 additional practices during the season, depending on the grade level. WHERE: Basketball games are played at a variety of Bloomington Public Schools, elementary, middle and high schools. 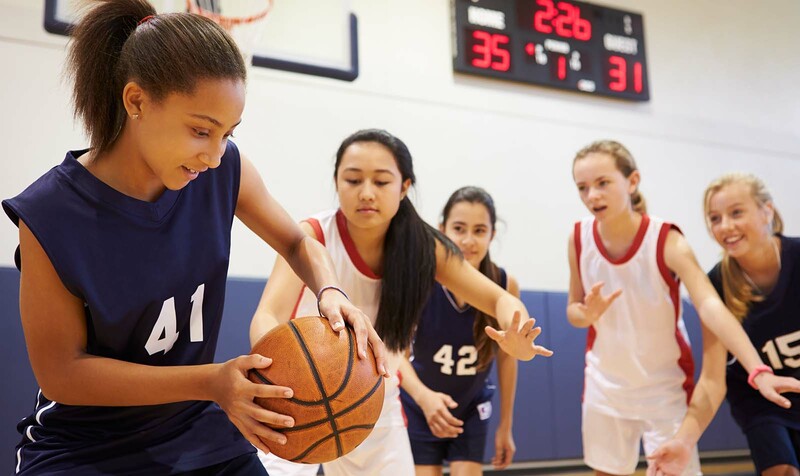 WHY: Basketball helps kids develop coordination and team-building skills plus gives youth a solid foundation for creating an active lifestyle. EQUIPMENT: Tennis shoes and gym shorts, BAA provides t-shirt/jerseys for each player. Coaches will have basketballs for the team to use. WHAT: This is boys and girls together possibly in groups. There are no games in Mini-Mites and there will NOT be a season ending tournament. There will be “Basket Coaches” and each evening the athletes will be focused on 70 minutes of drill instruction, basic skill development, and FUN competition focused on passing, dribbling, shooting, layups, etc. Our emphasis at this level is to get the Bloomington youth ready to go to higher levels of 5 on 5 plays. WHAT: Each evening begins with a 25 minute practice followed by a game. The game has 8 segments of 4 minutes with running time the first 3 minutes and stop time the last minute. Equal rotation rule applies. WHAT: Each evening begins with a 20 minute practice followed by a game. The game has 8 segments of 5 minutes with running time the first 4 minutes and stop time the last minute. Equal rotation rule applies. WHAT: Each evening begins with a 20 minute practice followed by a game. The game has 8 segments with 5-minute running time and stop time the last two minutes of each segment. At this level the girls play with BAC (Burnsville) league and LKVL(Lakeville North and South) games are played in Bloomington with one possible on a Saturday in BAC or Bloomington. WHAT: Each evening begins with a 20-minute practice followed by a game. The game has 8 segments with 4-minute running time and stop time the last minute of each segment. At this level the girls play with BAC (Burnsville) league. You can form your own team but not necessary.